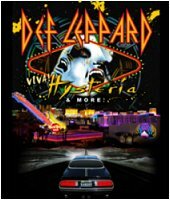 The long awaited Def Leppard VIVA Hysteria! residency starts tonight and Phil Collen has spoken to Las Vegas magazine about the setlist. The VIVA Hysteria! residency kicks off at The Joint in a few hours time. Phil has said the band are ready to play material from the first two albums, songs from Pyromania that haven't been played in 30 years and even demos. "We're going to do a deep cuts set," says Collen. "We're actually going to play songs we've never played before, stuff like demos that never made it onto an album, and material from the first and second albums. We're going to do 45 minutes like that, go off, come back on and do Hysteria in its entirety, and then an encore. It's going to be a long, big night. We're basically our own support band."